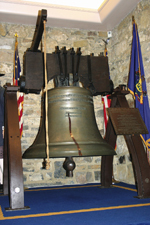 The Liberty Bell Museum is located in historic Zion’s Reformed United Church of Christ, Allentown, Pa, which is on the National Register of Historic Places. The site of the first church in Allentown, it was used as a refuge during Indian raids, a revolutionary war hospital, a gathering place for the reading of the Declaration of Independence, and more. This rich history is celebrated at commemorative services every February, May, July, and September.